Virginia state policy allows students to earn dual credit for academic or CTE postsecondary courses taken at their high school or a postsecondary institution. Public postsecondary institutions in the state are not required to accept dual-enrollment credits (ECS, 2015). Virginia is not participating in the Early College High School Initiative (ECHSI). More information about schools participating in ECHSI is available at the ECHSI website (Jobs for the Future, n.d.). Virginia has adopted the National Career Clusters Framework and is implementing all 16 Career Clusters. 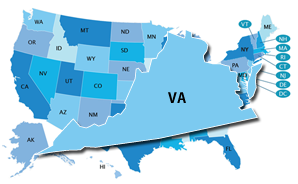 In Virginia, the Academic and Career Plan is designed to be a working document that maximizes student achievement by having the student accomplish goals in middle and high school that lead to postsecondary and career readiness. The plan should be student-driven and maintained by school professionals working cooperatively to assist the student in reaching his or her goals in the most logical academic and career path. Virginia's Academic and Career Plan is mandated by the state. It includes all students in Grades 7–12. Academic and Career Plan implementation began in the 2013–14 school year. Virginia’s state-specific Early Warning System is called the Virginia Early Warning System (VEWS). Early Warning System data are reported at the student, school, and division levels. It is not publicly available who can access the Early Warning System data.